Can there be any doubt that the mind of James Martin, a Jesuit priest is distorted beyond any semblance of reason in matter of the faith? Martin recently stated that the catechism needs to be changed. Homosexual orientation is "objectively disordered," and the acts are "intrinsically disordered." Martin, and other to be sure, (we know who you even though we won't name you) wishes it to be "differently ordered." This is a blasphemy; for it accuses God of creating a man or woman who will, beyond their control, live a lifestyle based upon repugnant sin that would destine them to a life of suffering and an eternity cut off from God. What kind of god would do this? Certainly not Christian God, the Catholic God, the Father, Son and Holy Ghost. It would be a god who would be evil, a god who would not deserve worship or adoration. A false god, a liar from the beginning. There was a time when a priest's superiors would discipline this kind of priest. The fact that they do not proves that they not only agree with him, but that they are filled with hate. If they truly loved him, as a priest, a spiritual son, they would remove him from public ministry and get him the deep spiritual help he so desperately needs. James Martin, S.J. is unfit to be in the public square commenting on the Catholic faith. A man unfit for priesthood. A man with a distorted mind crying out to the world for help and not having enough sense where to go to find it. OK, now. So why did Pope Francis appoint this smug man as one of several consultants for the Vatican's Secretariat for Communications? Logic dictates it would be to "help" communicate the undermining of Catholic moral teaching. What else? If the Pope was clear on, and loyal to, Catholic moral teaching, then this appointment could be interpreted as a case of, "keep your friends close, and your enemies closer." But, from the beginning of Francis' pontificate clarity has been most lacking. Never thought I would say that I am repulsed by entire hierarchy. They have destroyed my faith, by first destroying my faith in man. Good job, Father. Good job for leading yet again an untold number of souls and potential converts to the Faith away from said Faith. Good job for practically embarrassing the founder of your order yet another time, by smiling at being called what you really are: a material heretic. It's not so much Catholic Mean Tweets as it is Catholic Accurate Tweets (for the most part - I wouldn't advocate killing Jesuits). Great job. You're also misrepresenting what words like compassion and persecution mean, and totally twisting the Church's teachings on homosexuality, the Blessed Virgin and our Lord Himself. Just stop. Please. For the love of God, whom you vowed to serve on your ordination day. 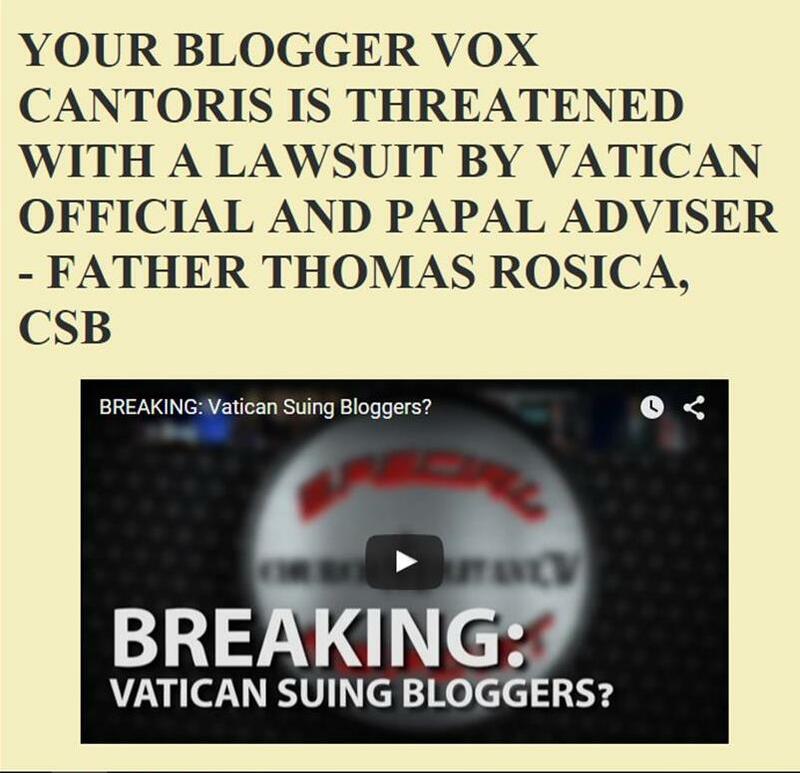 Come clean and answer Michael Voris' pointed questions to you. You'll save a lot more souls that way. I'm going to unfollow you now so neither of us can bother each other anymore. I will be praying for you, like I do for every priest I know. No response from Fr. Martin. Just the sort being promoted these days. What does that tell you? For years I had a feeling that Mr Coren's soft spot for gay issues would get him into trouble, and it led him right out of the Church. He was never really as blatant as Fr Martin has been. Unfortunately, this issue will be a lot of Catholics' undoing. Kyrie eleison. Everyone....please, please read (and re-read) the book of Jude to understand EXACTLY what is happening in our Church and how to survive this onlaught of evil ecclesiastical miscreants. Our beloved Catholic Church is split into two. We don't need any Cardinal or Bishop or priest, and certainly not a pope, to tell us that, it's obvious. Dan, don't you dare let these creatures destroy your faith, and thereby give Satan the victory. As a Christian, you are a soldier of Christ, you are to gird your loins, put on the armor of God, and fight, never give in, to these worldlings. We are in spiritual battle, and you cannot allow mere men to disturb your peace and definitely not, eternal life with Christ, which is your destiny. Get yourself to heaven, and take as many of your loved ones and others with you as you can. The true church exists. Find a Latin Rite Mass and go, even if once a month, or, attend Holy Mass on weekday mornings, when there are fewer shenanigans. Read Scripture, increase your prayer life, pray the Rosary, read books from authentic Catholic teachers from yesteryear. And find joy. We're in this together. You are not alone in this. Hang tough! He should do this outside of the Church, but will never leave, because they always planned to destroy the Church from within. Honesty was not going to get them there. Bergoglio is the same.